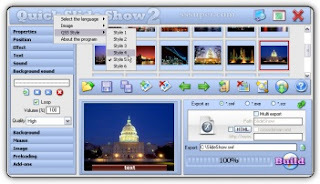 You can place slide shows created by You on your personal web-site www.your_name.sssuper.com (e.g. www.andrew.sssuper.com) that is in any time can be visited by your friends where they will feel with You're your impressions of holidays, family vacations on the seaside or in the mountains and many other unforgettable events of Your life. This will make communication process with your relatives more interesting and pleasant.